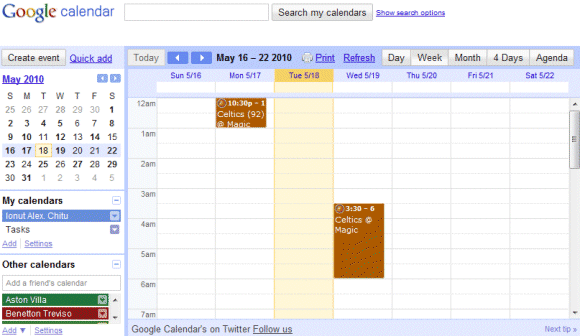 Google Calendar has a new look that's more consistent with other Google services like Google Docs or Gmail. Google says that the only functionality that has changed is that the Tasks link has been removed. "Create event" is now a button, instead of a link. 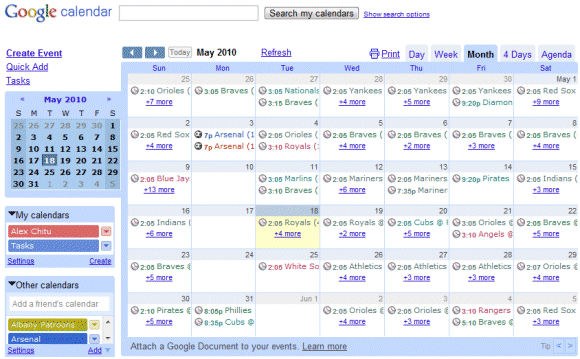 The calendar from the left sidebar has more visible arrows and it no longer has a blue background. Update: The new interface is also available for Google Apps, but administrators need to enable pre-release features in the "domain settings". How can i see the new interface? Much cleaner interface. The leaked screenshots of Gmail suggest this will be similar too. Alex, are you a Villa fan? By removing the Tasks link I wonder what that means? Is Tasks going to be promoted or deprecated? Should make sorting life out a tad easier. @Schultzter, it just was moved of place. Loook to "my calendars" group. I suggests that google remove the Tasks button just because not many people cliking on Tasks in that place. Do not remember any major changes for Google Tasks for a long time (except creating mobile version)... looks like its not priority for Google today. I do not know why, do people deslike advenced task manager??? Mine is still the same old one. 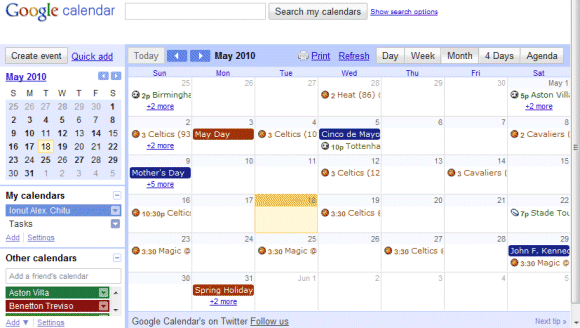 Google tasks is such a pain to use right now, its not even as smart as the quick add for google calendar. No time limit, no reminders for tasks due. The new look is very nice, nice buttons, much more organized. From a college like project to a full blown Google product! Any one has any idea about the deal with Public calendars? I know it was removed long back. I WANT MY SNEAK PREVIEW BACK FOR CALENDARING! THEY PROMISED IT WOULD BE RELEASED THIS WEEK (I have an in with developers) AND THEY LIED!!!!!!! The new look is okay. Half hourly events as default ?? I quite like the new look. I must agree that the "sneak preview" features were a bigger improvement though, does this mean those are only around the corner too? Our users loved it so.